Our social spotlight this week is going to focus on the social discovery site StumbleUpon. StumbleUpon is not your usual social network, you do not post ‘status updates’ or share pictures, instead StumbleUpon is all about discovery of a different kind. Simple in theory, StumbleUpon helps its users explore new and interesting stuff on the web by first asking for their interests and then matching these interests with sites they believe the user will enjoy. With StumbleUpon reaching the 25 million user milestone last week and growing at the rate of a million users a month it seems many more are enjoying the simplistic nature of the online adventure that StumbleUpon can take you on. The StumbleUpon community is all about exploration and discovery. You ‘Stumble’ to discover new websites and you can interact with other liked minded users to discover new connections. You choose your interests from a selection of over 60 catergories ranging from technology and computers to philopshy and conspiracies. Each category contains countless number of websites, images and videos from the web which you can stumble upon during your journey. This vast amount of websites available has led to the social site being described as the entire Internet, all in one place with over 50% of all web referral traffic from social media coming from StumbleUpon, far greater than Facebook, Twitter and YouTube. Not only is StumbleUpon a wonderful addictive social network for users but it also has its marketing possibilities as well. Not only can you join and interact with groups about topics centred around your business but StumbleUpon has also featured in several digital innovative marketing campaigns. An example is the recent tourism campaign for Norway: Visit Norway. The interactive campaign works by being nonintrusive. Users ‘stumble’ upon the Visit Norway web page like any other they find through stumbling. Visit Norway has created a 360 panaoromic sky cam which allows the user to twist and turn the camera to explore the amazing Norweigan mountain range pictured . The page contains several viewing points and also external linkes to online booking opportunities. 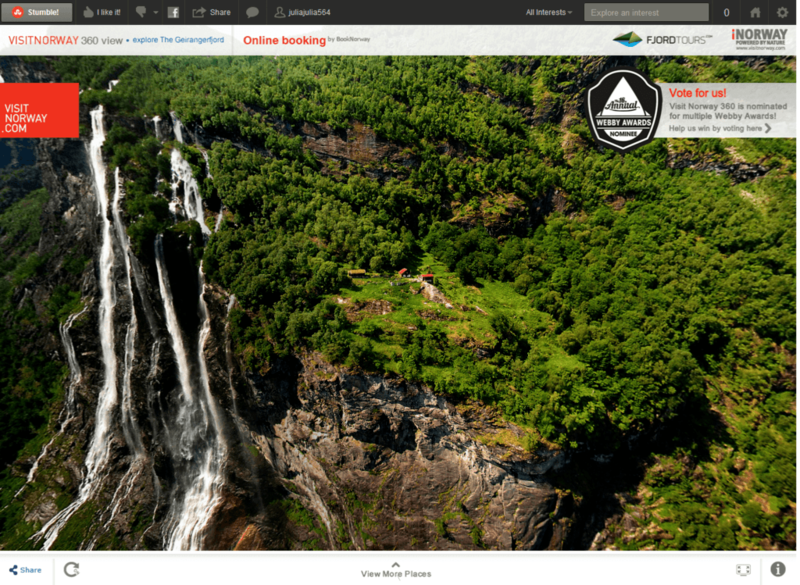 VisitNorway.com using StumbleUpon to promote tourism in Norway. It is StumbleUpon’s nonintrusive manner that could lead to it becoming a leading marketing tool in the future. Unlike Facebook which has made its revenue streams extremely obvious with sponsored timelines and twitter which is testing promoted trends, StumbleUpon’s ability to feel almost anti-marketing may work in its favour. The fact that Visit Norway example used would only appear for users who have already declared an interest in nature/travelling/Europe or anything related to the campaign also means that marketing on StumbleUpon can be targeted to your target audience specifically. If you would like more information on how social media or other online techniques such as SEO could improve the online opportunities for your business, contact Innermedia.